The English Bulldog, colloquially known as the British Bulldog or Bulldog, is a medium-sized dog that originated from England. 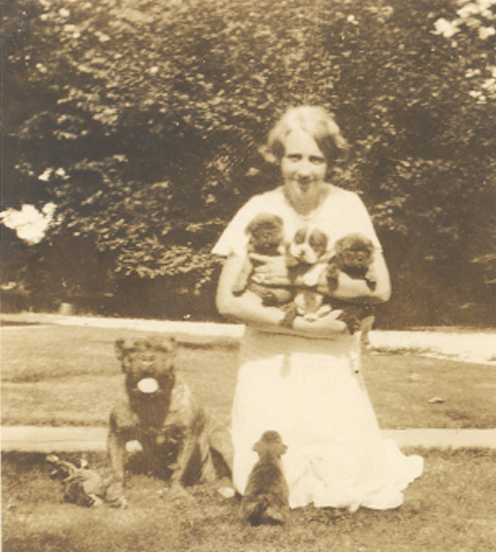 The breed was first registered by the AKC in 1934 in the non-sporting group. Today the English Bulldog is one of the most popular dog breeds throughout the world. The stout structure and folds of skin on the face are the unique identity of this breed. Most researchers agree that the Bulldog is either a cross between a Mastiff and a Pug, or a descendant from the Alaunt. The earliest mentions of the Bulldog breed date back to the early in 13th century when butchers used to keep dogs that were bred to catch and hold wild cattle. 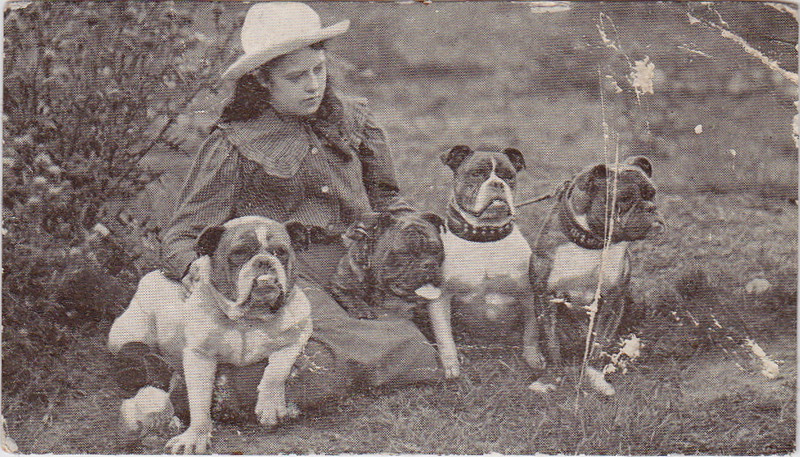 Later on, Bulldogs were bred for cruel blood sports known as bull baiting. 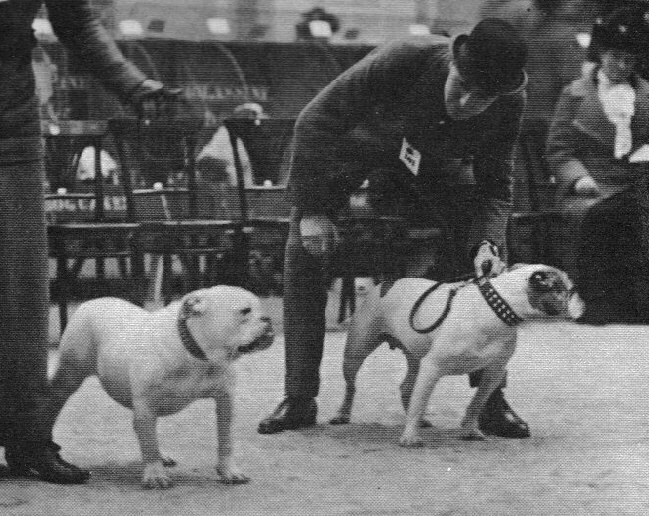 Bulldogs were not only forced to fight with bulls, but also badgers, lions, bears and even elephants. The blood sports were the popular pastimes of the masses that can be traced back to the year 1209. This was a sick form of animal cruelty to entertain the people back then. 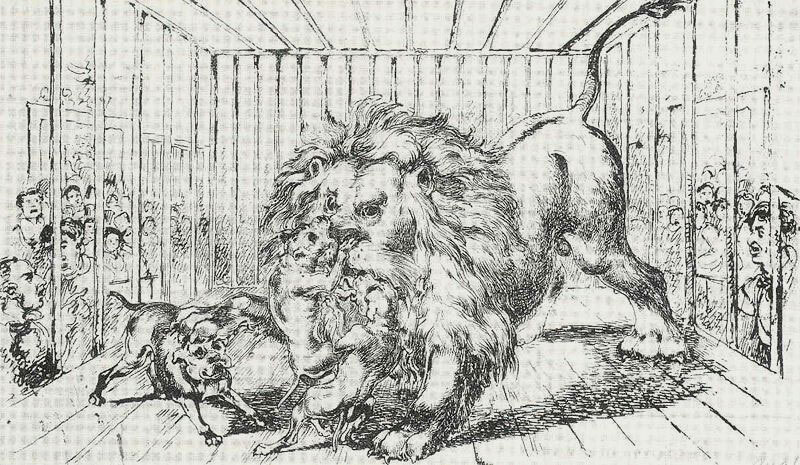 This form of animal cruelty as a ‘sport’ was finally banned in 1835. Normally the fight was staged in a field, a pit, or an arena. 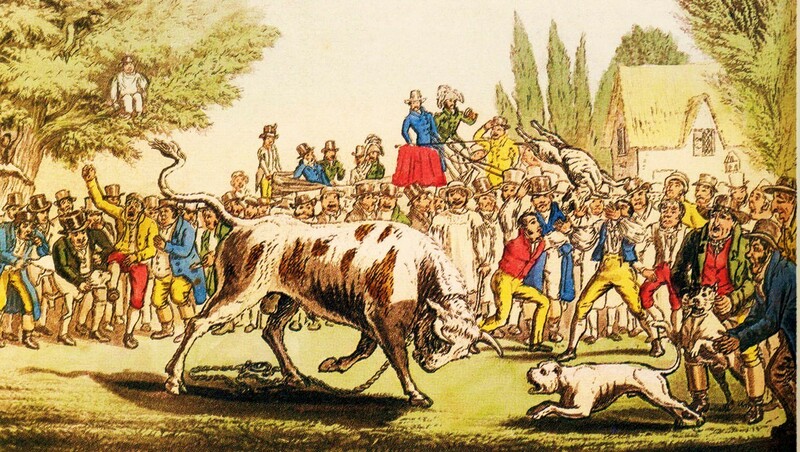 The concept of bull-baiting was for the dog to engage the bull. Bulldogs were trained to crouch low to the ground to shield their bodies from the bull’s horns when it charged. The shoulders were placed on the outside of the body. This was to make sure it could crouch low. Similarly, the hindquarters of the Bulldog are not as well developed as the forequarters, allowing the dog to be shaken violently without suffering any spinal injuries. The head of the Bulldog, like his body, is also the part of the fighting strategies that men wanted to develop. The short jaws (lower jawbone is longer than the upper jawbone) allows the dog to hang onto whatever it wants with a surprising tenaciousness. The grip of a Bulldog is very strong and so is the structure of the jaws. Should the Bulldog be able to latch onto the bull’s nose, the Bulldog has a short snout on the face upwards to allow breathing, while retaining its grip on the bull’s nose. Once bull-baiting was outlawed in the UK, it would seem that there would be no further need for the breed, and they would probably become extinct. But a few fans of the breed saved it by giving the Bulldog a new purpose. This is when the English Bulldog made the beautiful change from a fighting breed to a family breed. The Bulldog’s character changed over the years from an aggressive and vicious fighter, to a loving and loyal family friend. Nowadays, a Bulldog will rather avoid a fight and is considered one of the most gentle, calm and loyal breeds. Over the years the look of the Bulldog started to change as well. They became smaller, more stocky and got a more flattened face. There is a lot of discussion whether this was accomplished merely by selectively breeding smaller dogs or cross-breeding. Sadly, the last few decades, breeders started to breed even more for looks, and exaggerated the Bulldogs typical looks including their short face, short legs, small behind, and their wrinkles. Some of these features are the cause of some of the Bulldog breed specific health problems. 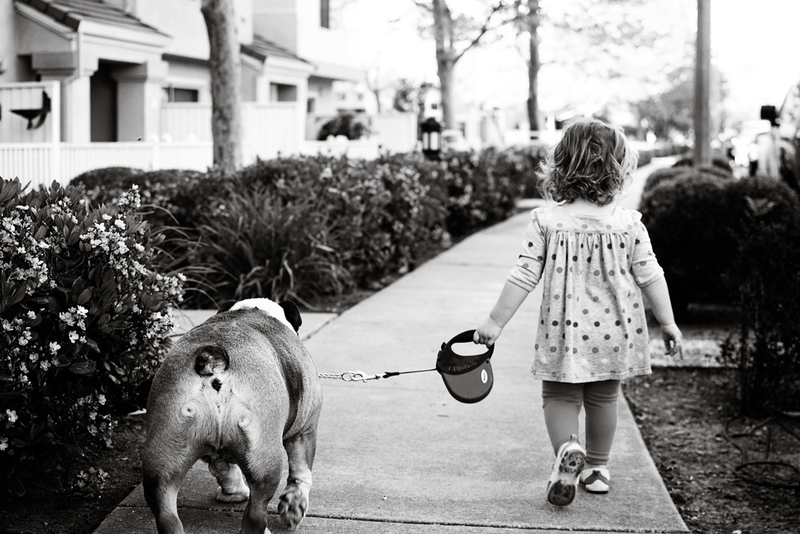 The English Bulldog is one of the most popular dog breeds these days. Most people will describe them as friendly, loving and funny creatures with a heart of gold. A Bulldog is a dog that will make an appearance not only because of its looks but even more so because of its striking character. Because the Bulldog has such a mild temperament and is very loyal and gentle, it makes an ideal family pet, especially for people who live in the city. 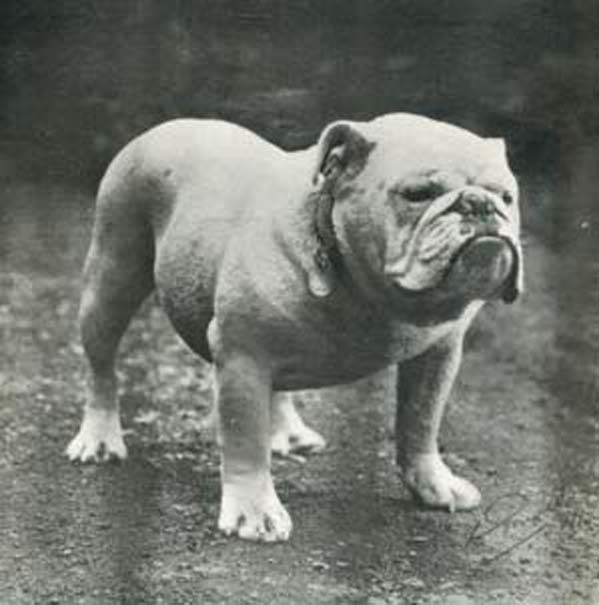 Also, the Bulldog gained a lot of popularity as a very widely used mascot. In the US alone, the Bulldog represents nearly four dozen universities and 250 secondary schools. It is also the unofficial mascot for the US Marines and various sports teams. Bulldogs are everywhere … in the movies and tv shows, on postcards and posters, you see them everywhere! How can we explain this breeds popularity? In my personal opinion, what makes a Bulldog is not their unique looks, but but rather it is the Bulldog’s Character that explains it all. Read more about the character of the English Bulldog here. It is our hope and wish that we will use the example of how the breed was bred to a new standard of character in the past, and use what we know today about the Bulldog’s health, to maintain not only the English Bulldog’s character and looks, but also make the Bulldog’s health the number one priority. Strict rules regarding health MUST be a priority, and breathing, skin, and other health problems need to be bred out of the breed. The standards and rules need to be changed worldwide. This can only be done when veterinary experts, kennel clubs, breeders and owners worldwide work together. quiciera esta hitoria traducida al español …creeo es muy interesante..por favor en Eapañol..me encnataria leerla pero en Eapañol..Gracias. I wrote about something similar on my blog, http://mykidhaspaws.org/2013/09/07/46/ . It is truly sad what selective pressure has done to this beautiful breed. Great article! And I totally agree that vets, breeders, kennel clubs etc need to work together to stop this breed from becoming a complete mess. I firmly believe there should be strict standards for people to meet before they’re even allowed to breed to try and get rid of the backyard breeders who are simply doing it for money or because they think their dog is cute, regardless of what health issues it may have. Thanks for putting this out there! The breed was perfected by Spanish monks way back when. I love my bulldog !!! What a great article. My AKC English bulldog has longer legs because the breeder wanted to eliminate some of the shoulder, back and legs problems. Sadly I have some people tell me he must not be a ‘real’ English bulldog.